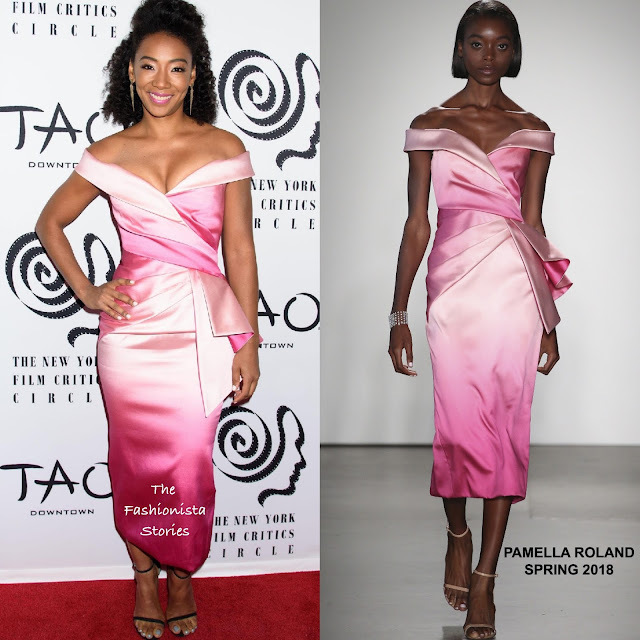 'Get Out' actress Betty Gabriel hit the red carpet last night(January 3rd) in New York for the 2018 New York Film Critics Awards at Tao Downtown in New York. For the occasion, she turned to PAMELLA ROLAND wearing a SPRING 2018 off-the-shoulder blush & fuchsia ombre Mikado draped cocktail midi dress which featured a back split. Love this dress & her beauty look but I find it to be a bit too tight on the bust. Also the black sandals doesn't work for me. Silver would have been an ideal choice. What do you think of Betty's look?